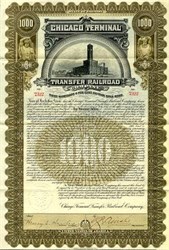 Beautifullu engraved uncancelled Gold Bond Certificate from the Chicago Terminal Transfer Railroad Company issued in 1897. This historic document was printed by American Banknote Company and has an ornate border around it with a vignette of the Chicago Terminal. This item has the signatures of the Company's President and Secretary and is over 113 years old. 85 coupons attached on top. In July 1897, a new company called the Chicago Terminal Transfer Railroad (CTT) bought the Chicago and Northern Pacific Railroad from the Wisconsin Central. While the Wisconsin Central (and ancestor Soo Line Railroad) no longer had its own direct connection to the city, it continued to use the line to access Grand Central Station until 1899, and between 1912 and 1965. In May 1897, the Chicago Terminal Transfer merged the Chicago and Calument Terminal. The Baltimore and Ohio Chicago Terminal Railroad (reporting mark BOCT) is a terminal railroad in the Chicago area, formerly giving various other companies access to Grand Central Station. It also served to connect those railroads for freight transfers, and is now controlled by CSX Corporation, the successor to the Baltimore and Ohio Railroad. In June 1887, a subsidiary of the Northern Pacific Railroad called the Chicago and Calumet Terminal Railway (C&CT) consolidated several terminal railroads in the Chicago area with lines running between the Atchison, Topeka and Santa Fe Railway at McCook, Illinois to the south and south-east to Hammond, Indiana and a connection with the Baltimore and Ohio Railroad. In March 1890, another subsidiary of the Northern Pacific Railroad bought the C&GW along with several other WC lines in the Chicago area, consolidated them all as the Chicago and Northern Pacific Railroad (C&NP). The next month, the WC had itself leased to the Northern Pacific. As they were both controlled by the same railroad, the C&NP and the C&CT were linked together with new construction and trackage rights. The lease arrangement between the Wisconsin Central and the Northern Pacific worked until the Panic of 1893, when the WC was freed from the lease, and the C&NP was again placed under the control of the WC. Weakened by the prolonged economic downturn, the C&NP was bankrupt by October 1893. In July 1897, a new company called the Chicago Terminal Transfer Railroad (CTT) bought the C&NP from the Wisconsin Central. While the WC (and successor Soo Line Railroad) no longer had its own direct connection to the city, it continued to use the line to access Grand Central Station until 1899, and between 1912 and 1965. 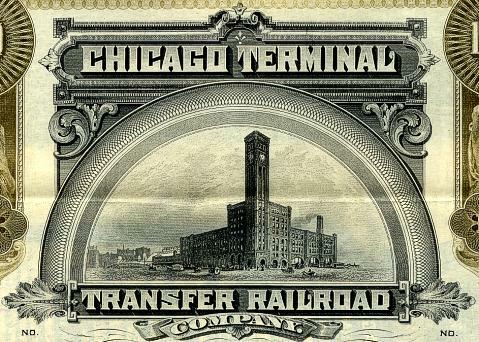 In May 1897, the Chicago Terminal Transfer merged the Chicago and Calumet Terminal. The Baltimore and Ohio Railroad began using Grand Central Station in 1892, when a connection between the CTT and the B&O at South Chicago. When the Pere Marquette Railroad was completed to Porter, Indiana in 1903, it also used the CTT into Grand Central Station. On January 6, 1910 the Baltimore and Ohio Chicago Terminal Railroad was created to purchase the CTT at foreclosure, giving the Baltimore and Ohio Railroad control of the both the terminal railway system, as well as Grand Central Station. Operations The railroad was strategically located in Chicago; connections made at Forest Park and trackage rights allowed the Minneapolis, St. Paul and Sault Ste. Marie Railway (�Soo Line�) (which had leased the Wisconsin Central in 1909) and the Chicago Great Western Railway access to Grand Central Station. The Pere Marquette Railroad and the Baltimore and Ohio Railroad (including its grand Capitol Limited) also used the B&OCT to access Grand Central Station.